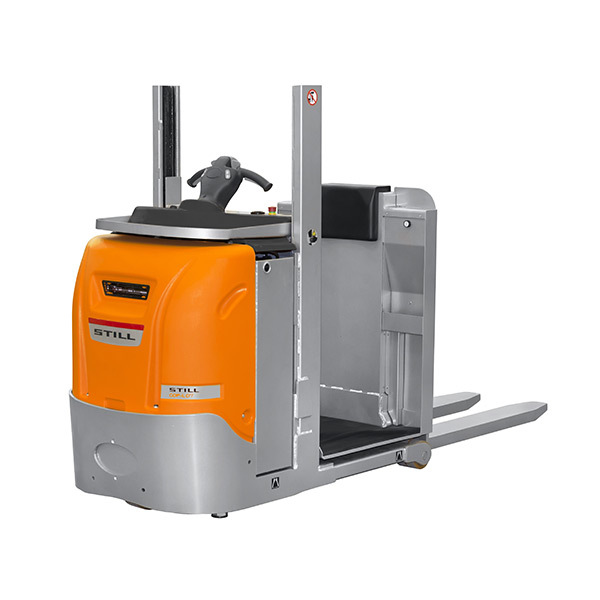 The compact and agile COP-L 07 with a stand-on height up to 1200 mm is the perfect choice for order picking at the first and second level. 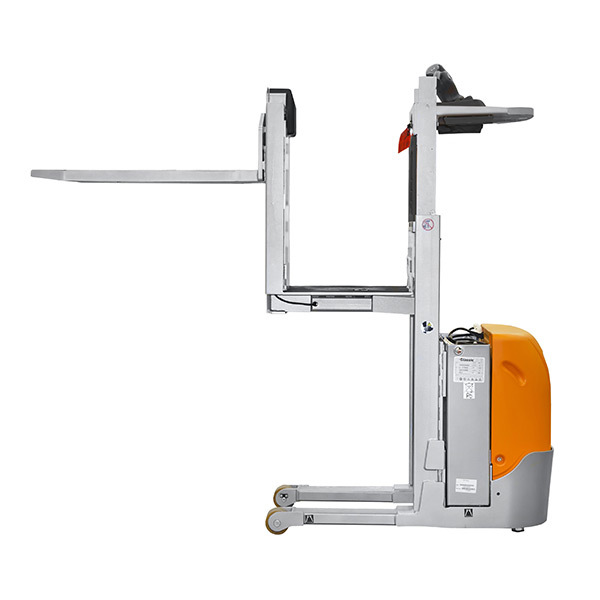 On request this truck is also available with ergonomic auxiliary lift or adjustable forks. 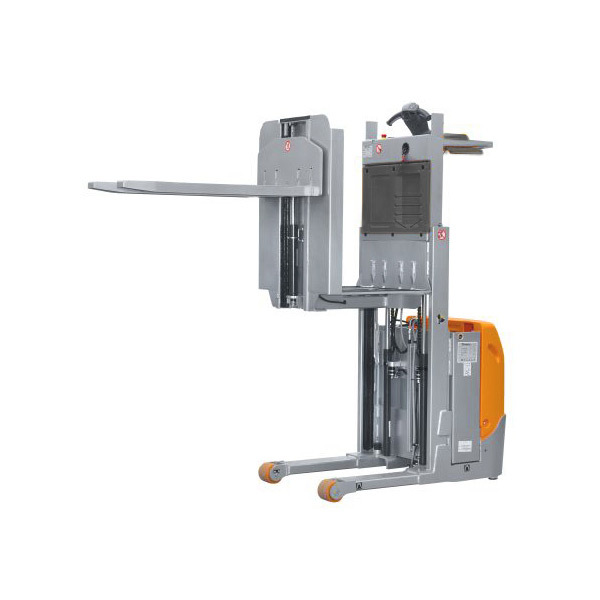 The order pickers of the COP series combine high agility for narrow warehouses with excellent driving dynamics and high productivity also when order picking at first and second level. 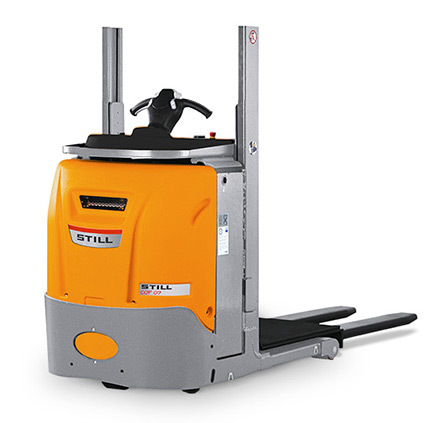 The special drive concept of the COP series was derived from the low lift trucks with a centrally situated drive wheel and strong lateral castor wheels offering perfect traction. This allows the COP to travel at high speeds also when cornering and easily trespass ramps and transitions. Its rugged covers are made from resilient plastic that withstand even strong impacts without permanently deforming or breaking. 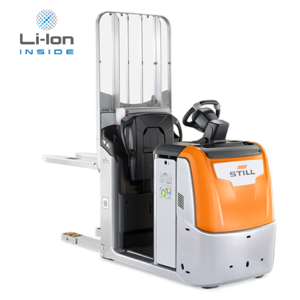 The patented initial lift mechanism makes the truck very short providing an outstandingly small turning radius and high manoeuvrability. By standard the COP is equipped with an electric steering system. Multi-function cockpit to operate all functions for lifting and driving. 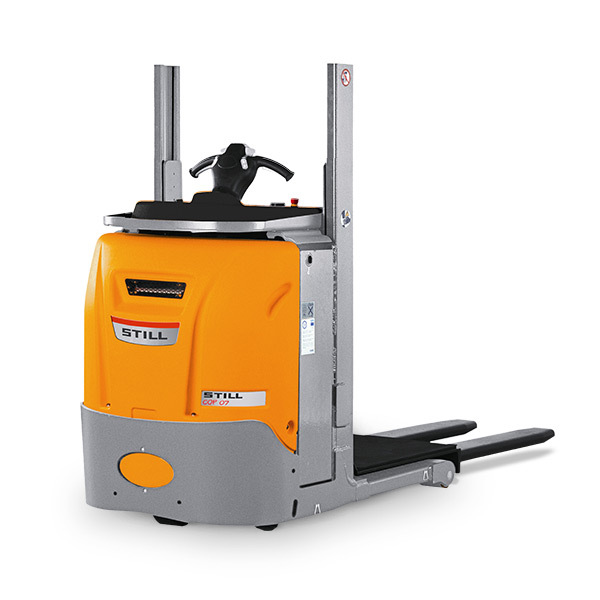 The stand-on platform for the driver provides a large space covered with a soft, anti-slip rubber mat at low access height to make mounting and leaving the truck easy and comfortable. The ergonomically shaped rear wall offers the driver a comfortable and safe ride also when travelling fast. The driver’s compartment offers numerous deposit trays for tools and documents. 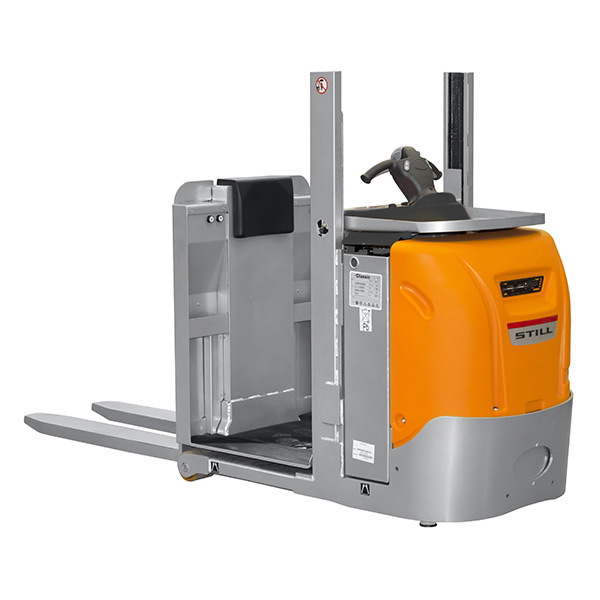 To accelerate order picking at higher levels, the COP 20 and COP-H 10 models are available with an optional 900 mm platform lift. Simultaneous lifting of the platform and driving as well as the possibility to lower the platform by depressing a foot switch allows maximum turnover performance. 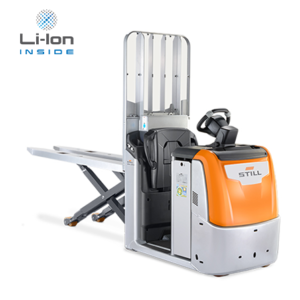 170 kg lift capacity and the well dimensioned deposit space in front of the cockpit make the lift platform an indispensible equipment for every day operation and excellent order picking performance. 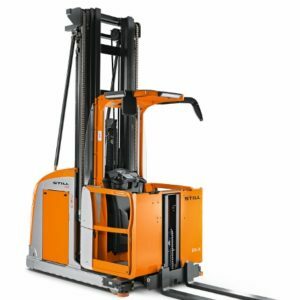 The driving speed is automatically adjusted to the current lift height. energy recuperation to reduce energy consumption. 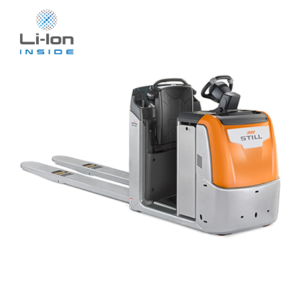 The 24-V battery facilitates easy access and can be exchanged for multi-shift operation by crane or optionally over the side by the integrated roller track. The battery tray provides a capacity for batteries up to 620 Ah. Emergency brake: electro-magnetic brake closing at each full stop or at depressing the emergency stop button. Electric brake: the truck brakes electrically when the driver releases the accelerator switch. During braking, the AC motor functions as a generator and feeds the recuperated energy back into the battery. Service brake: combined braking. An innovative system combining the motor brake and the electro-magnetic brake by the patented electronic “eABS” module. The brake closes on release of the “dead man switch” and on releasing the inching button. This system allows efficient braking without blocking the wheels. The patented castor wheels provide optimum lateral stability when travelling with load as well as when travelling without load. The stability system “IntelliDrive” bases on the combined effectiveness of spiral and pneumatic springs to provide optimum stability in all conditions. Buttons for pedestrian operation in the backrest. Electric preparation for data terminal. The document provided for download is the updated version of the operating instructions for the standard truck. It does not include descriptions of customer options (UPA). For a concrete truck, please continue to request the respective specific manual according to the serial number and the year of production from the STILL spare parts service.